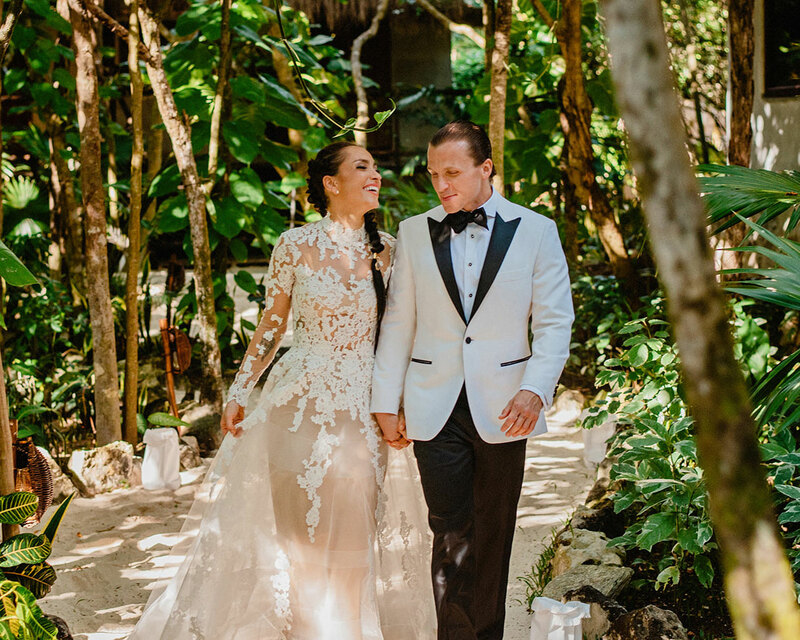 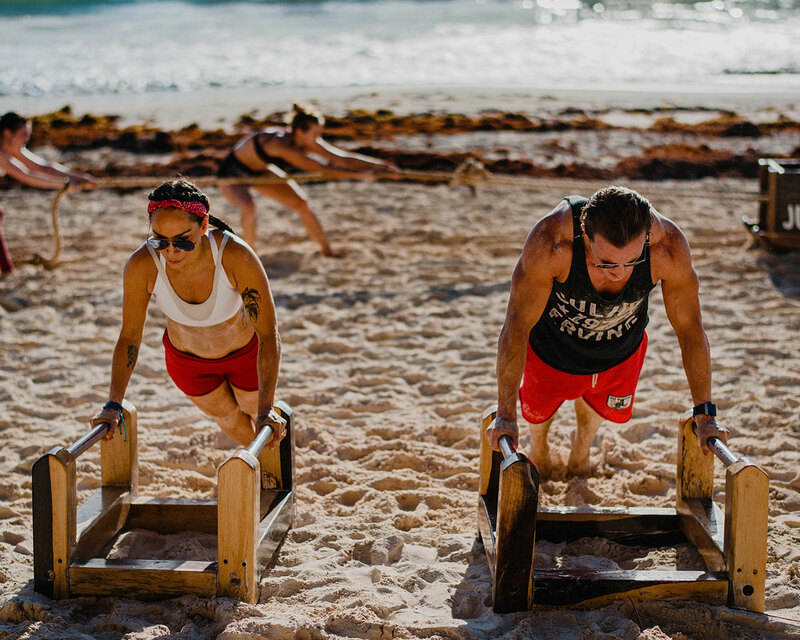 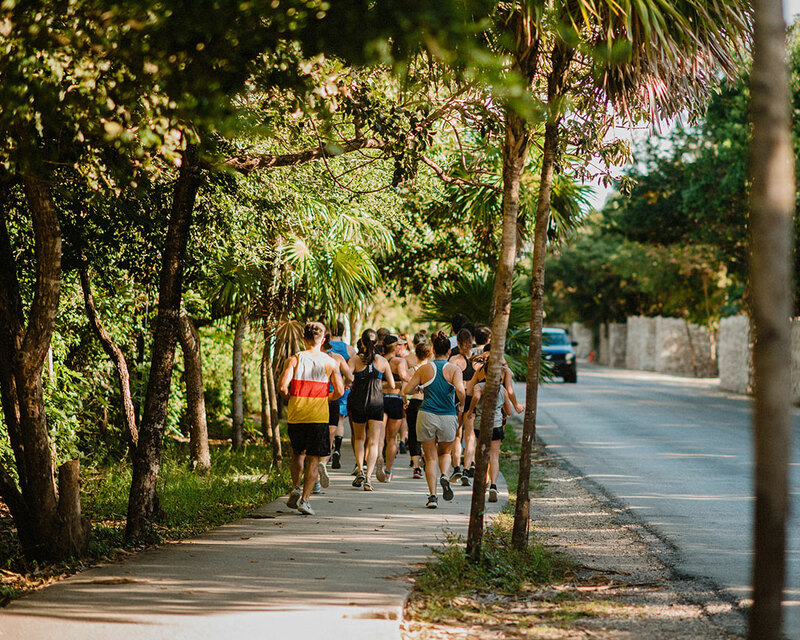 Fitness personality Robin Arzon’s Tulum wedding might not have been for everyone—it involved all-vegan fare, sunrise yoga, and a wedding day 5K—but the most important thing was that it was definitely ideal for her and her husband, investment manager Drew Butler. 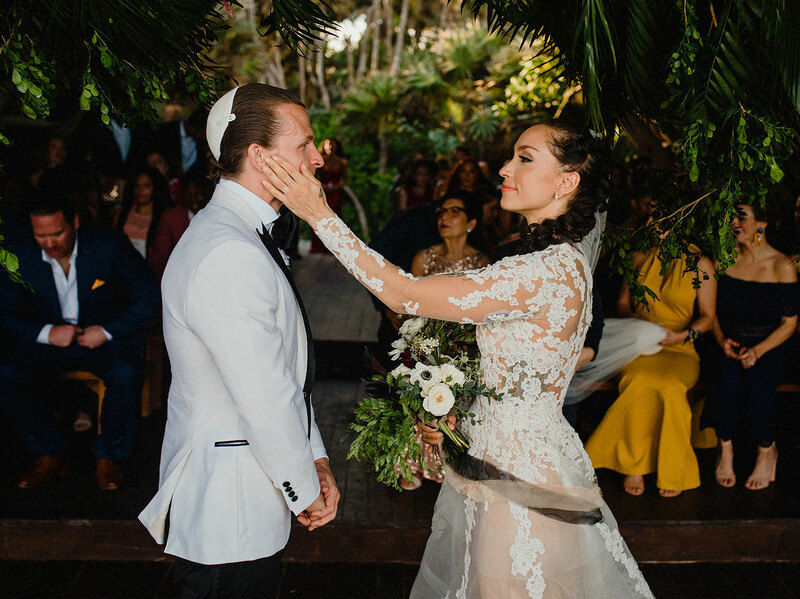 The pair, who met by chance at a speakeasy in NYC’s East Village back in 2016, wanted their February wedding celebration to have all the spirituality of Burning Man, combined with the tranquility of their natural surroundings, punctuated with great songs and music mixes to get their guests groovin’ on the dance floor. 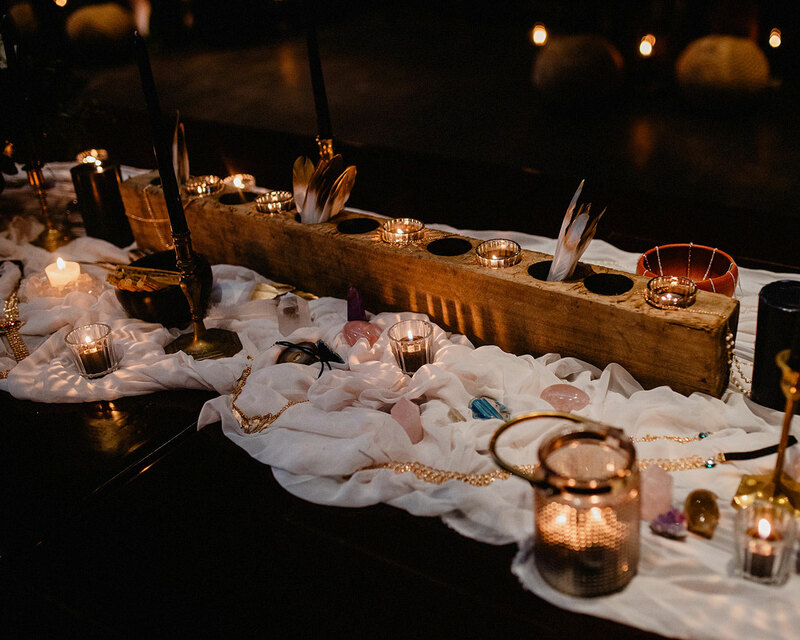 The couple hosted 90 of their closest friends and family for the weekend, which was divided into several different days’ worth of activities, all thoughtfully curated to encourage relaxation, flow, and community. 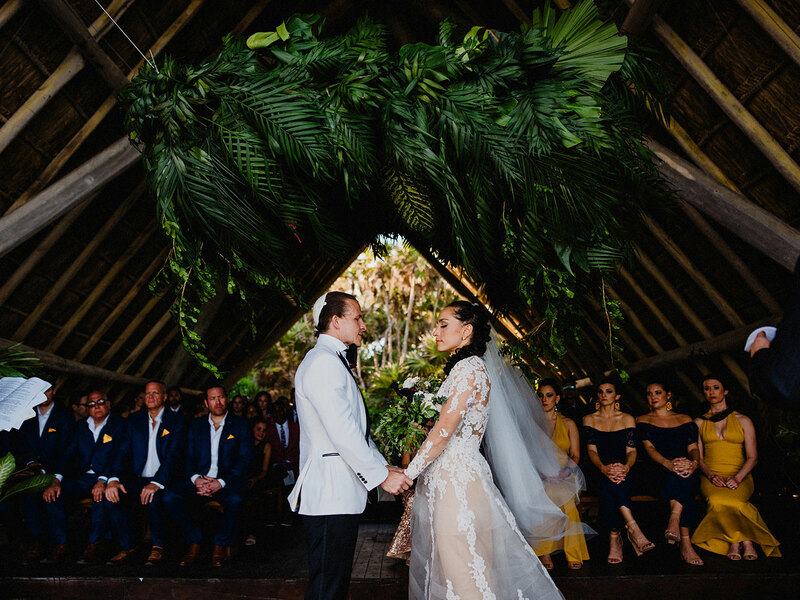 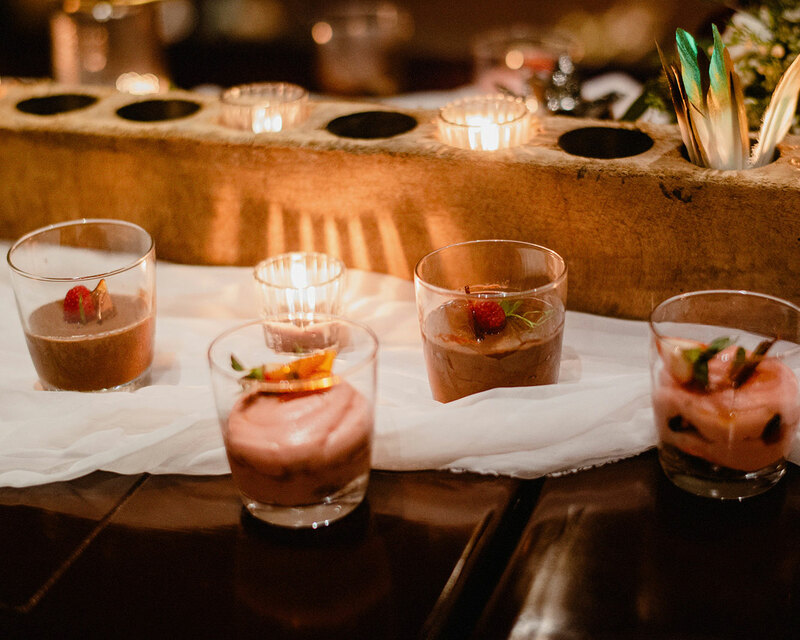 “We wanted our wedding to be a four-day affair where guests left feeling connected with each other and better than they felt when they arrived,” Arzon says. 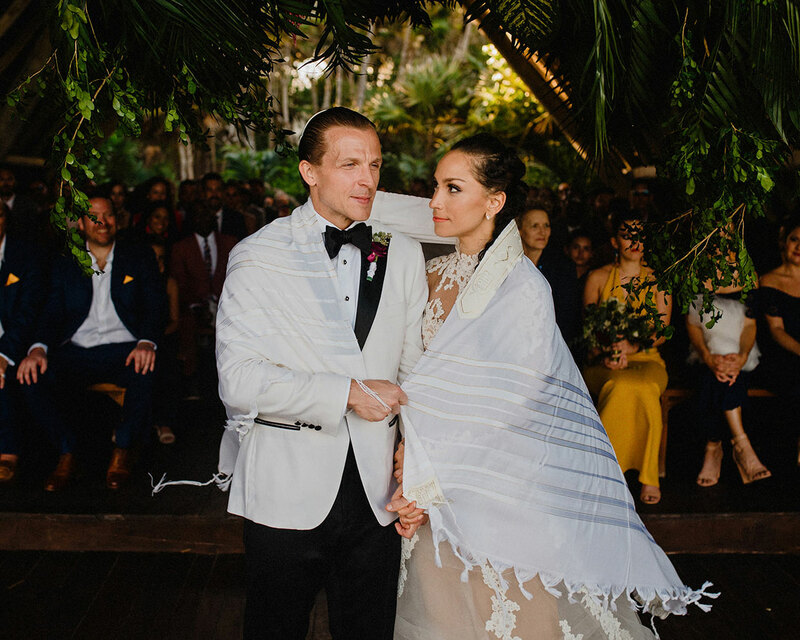 See the couple’s full wedding album captured by photographer Carlos Elizondo below. 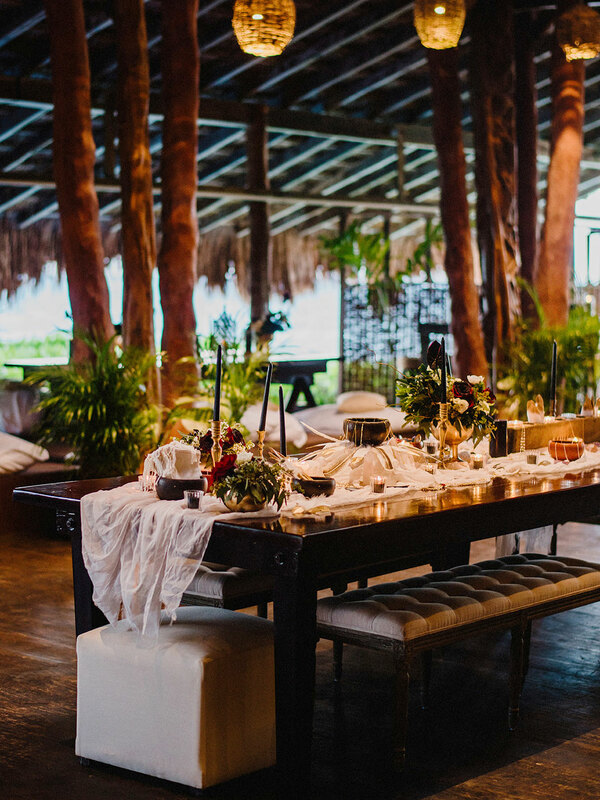 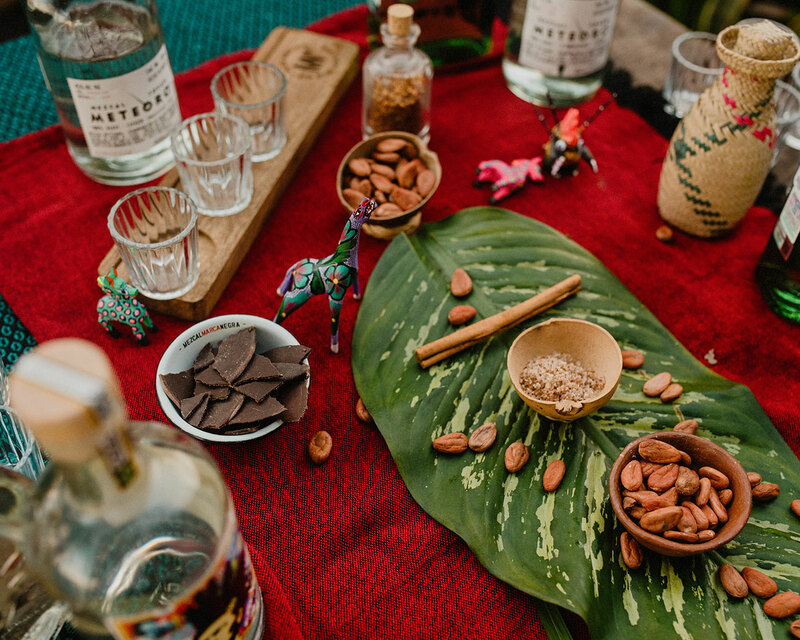 The couple went big with their wedding celebrations, hosting events for their guests at several different locations throughout Tulum from Thursday through Monday. 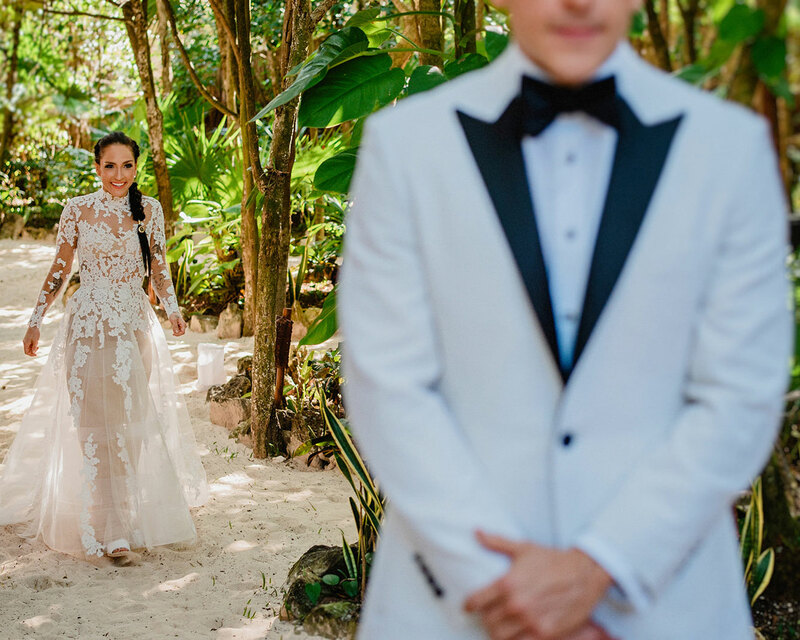 Both Arzon and Butler’s rings held personal significance to the newlyweds. 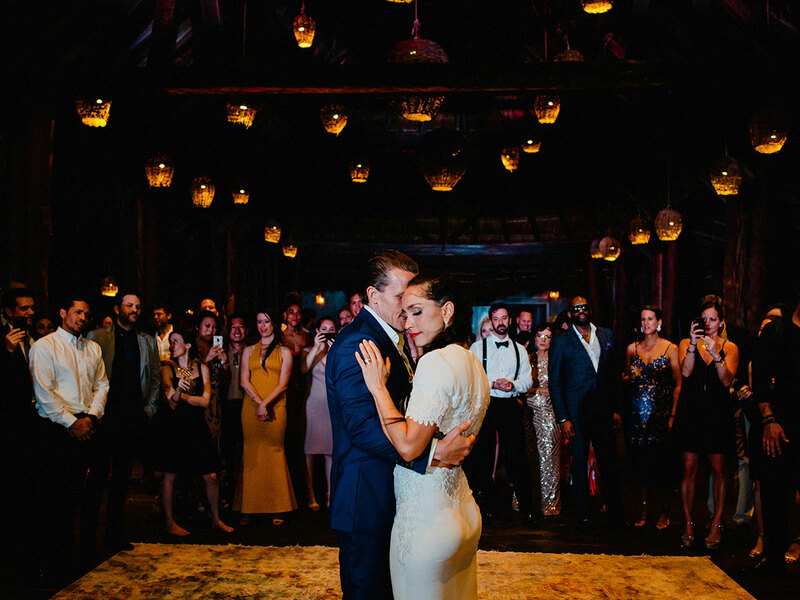 Butler custom-designed Arzon’s engagement ring (just months after they met! 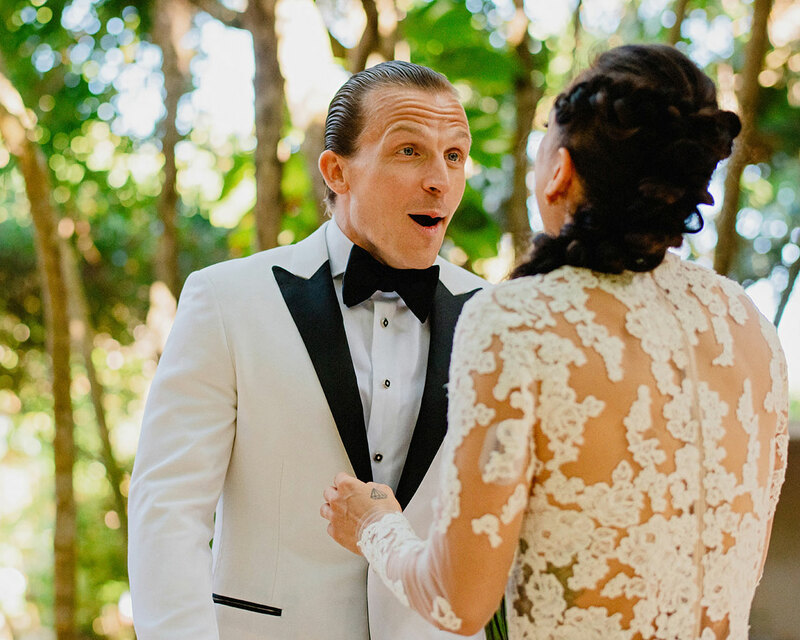 ), working with Doug Blanchard of Boston Jewelry Company to create a unique ring that looked like “She-Ra meets Beyonce meets Royalty.” Butler opted to wear his late father David Webb’s wedding band, a braided two-tone gold ring that Arzon renewed with a personalized inscription. 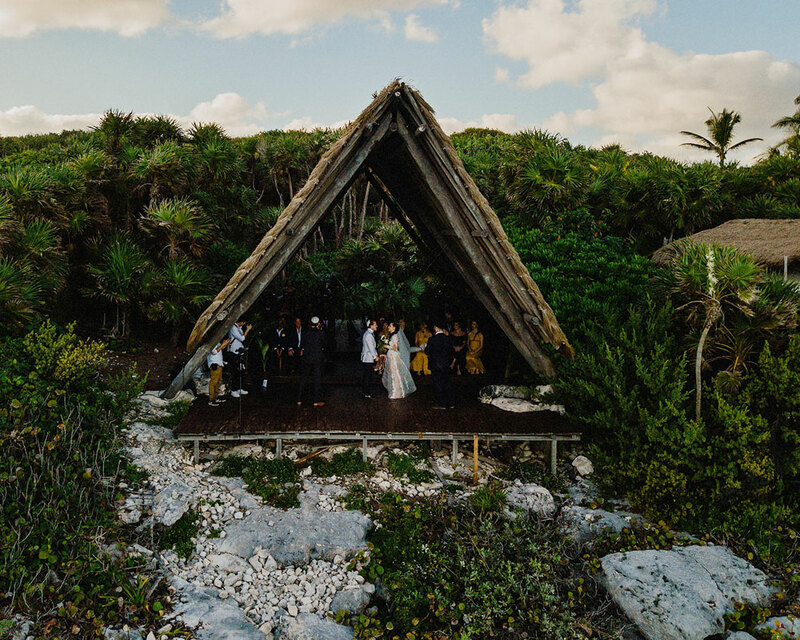 The wedding party looked, like the bride and groom, sharp. 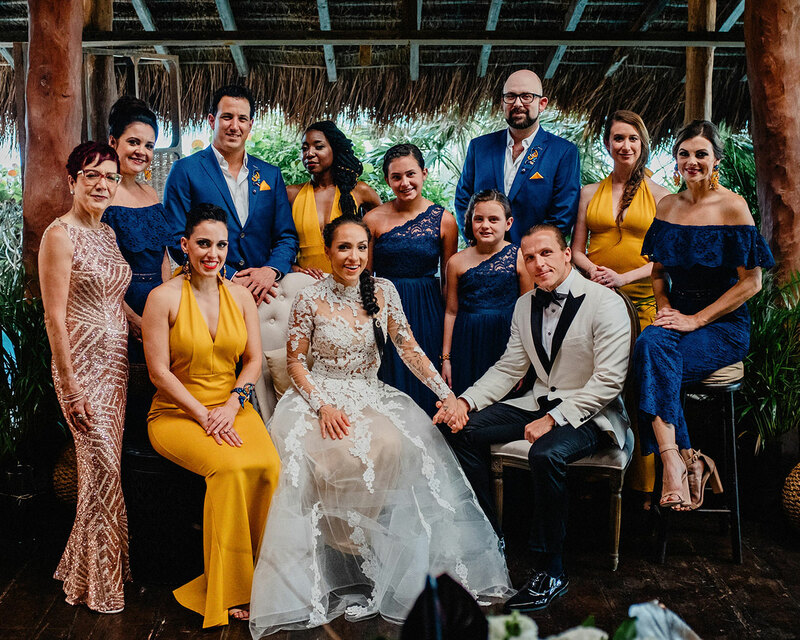 Arzon’s six bridesmaids had two options for their wedding day looks: either a navy lace jumpsuit or a body-hugging yellow dress. 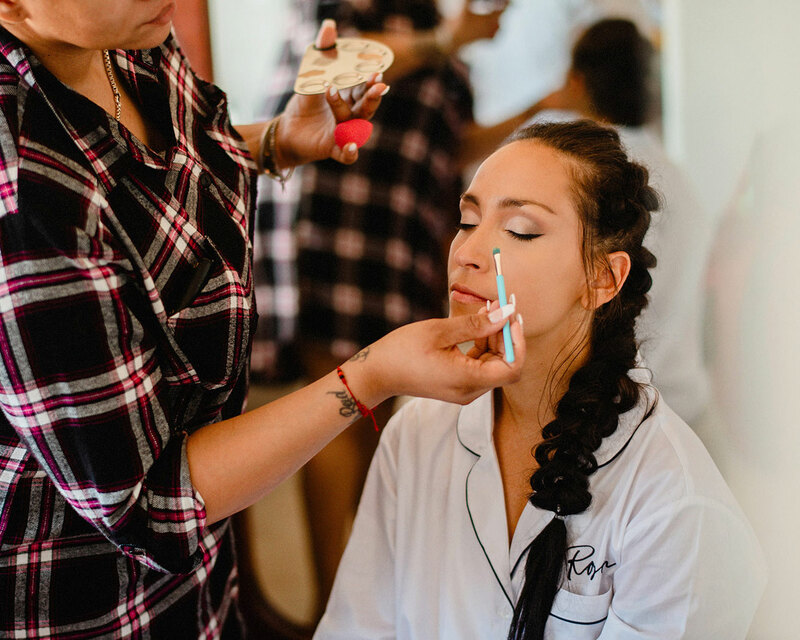 Hair and makeup was done by Tiffanie Garrett, who flew in just for the day from New York City. 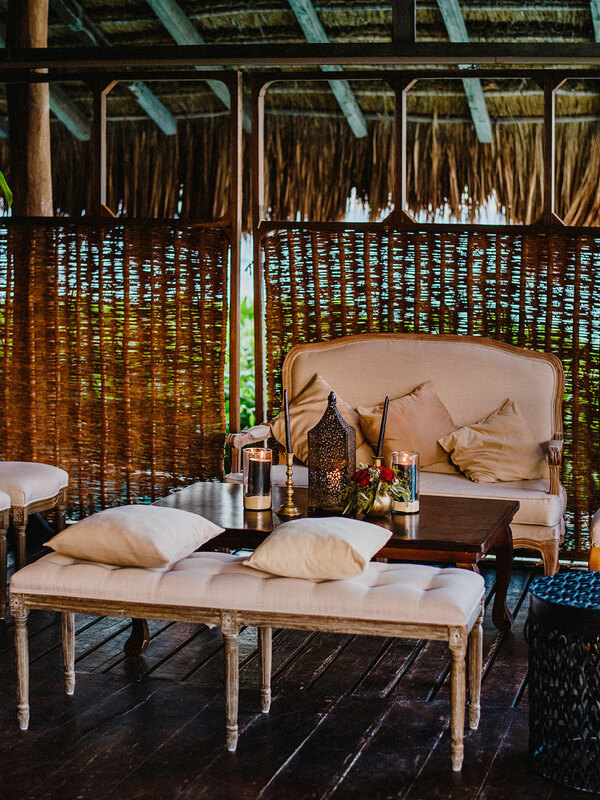 “Given the tropical location, we weren’t afraid of color,” Arzon says. 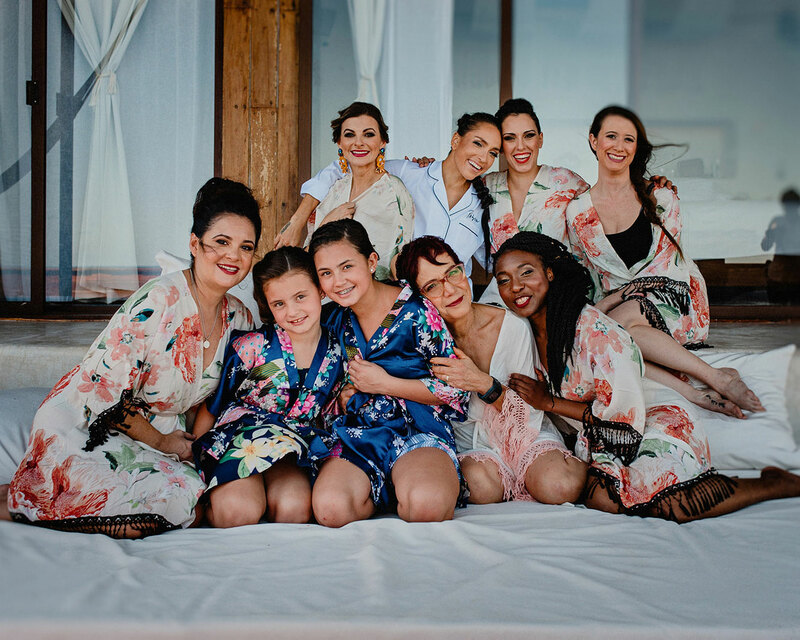 The gals all donned chandelier earrings handmade by Italian artist LeAleCreazioni to unify the looks. 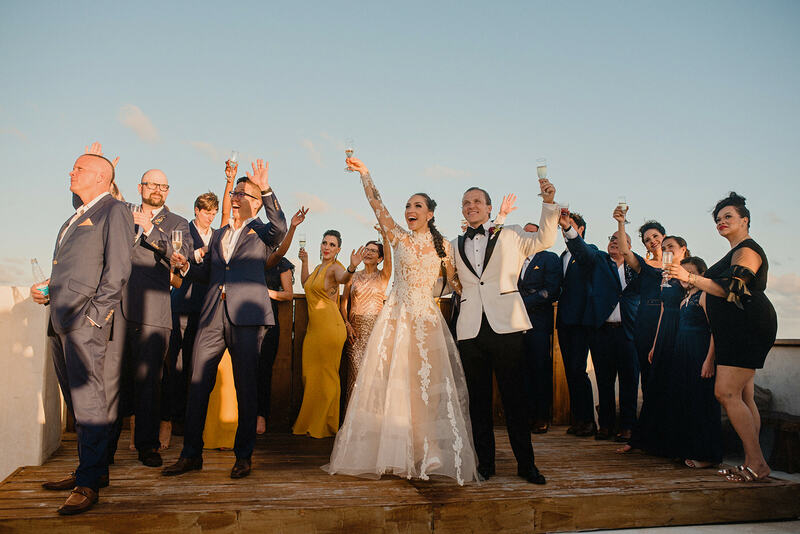 Butler’s six groomsmen wore custom blue suits with marigold pocket squares for a pop of color. 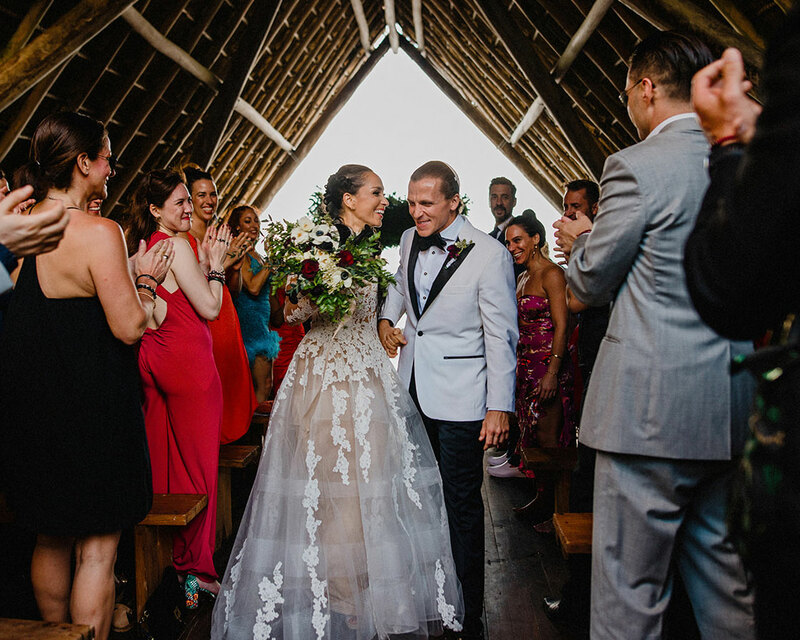 Their jackets were each inscribed with #arzoninlove as a subtle nod to the special occasion. 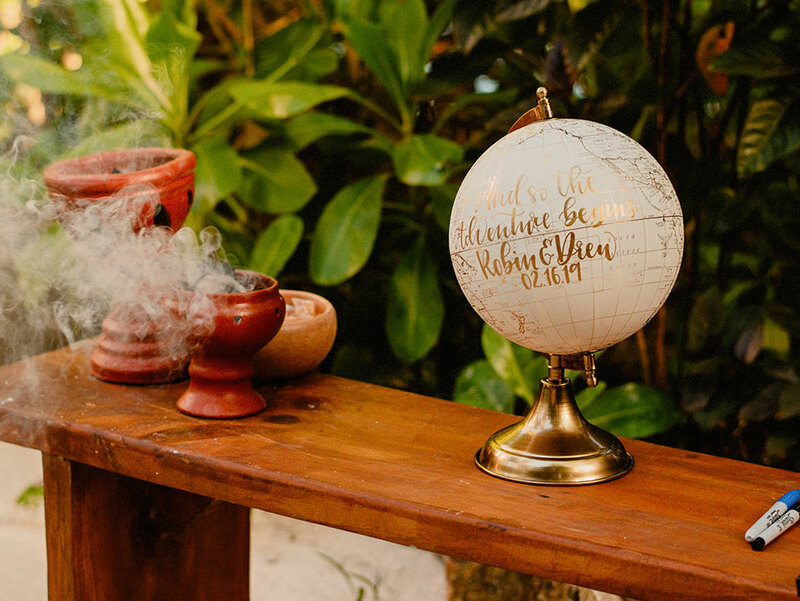 In keeping with the environmentally friendly feel of the five-day wedding ceremony (Arzon and Butler didn’t use any paper stationary, opting to send invitations and save the dates digitally), the couple similarly made conscious decisions about their flowers. 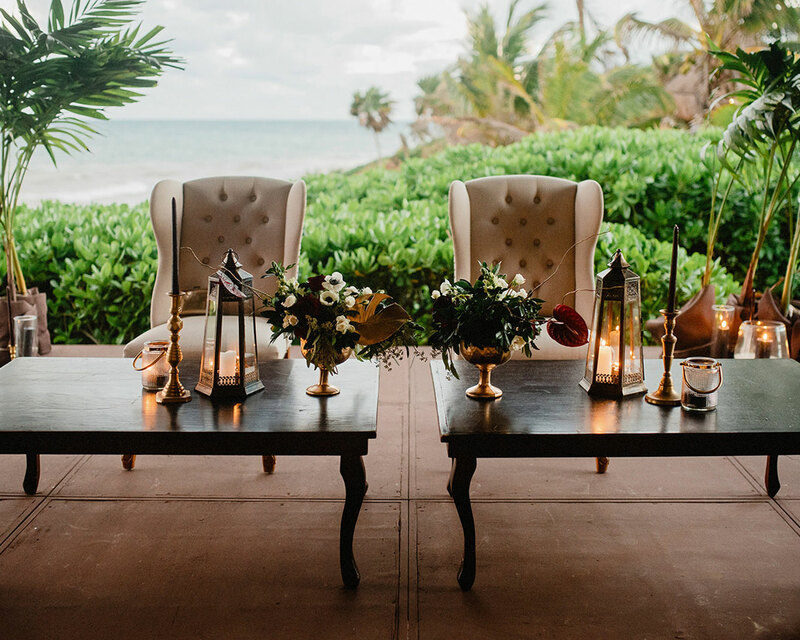 The event planning and design was done by Kerry Beach Events, who kept these details in mind throughout the process of filling out the venue. 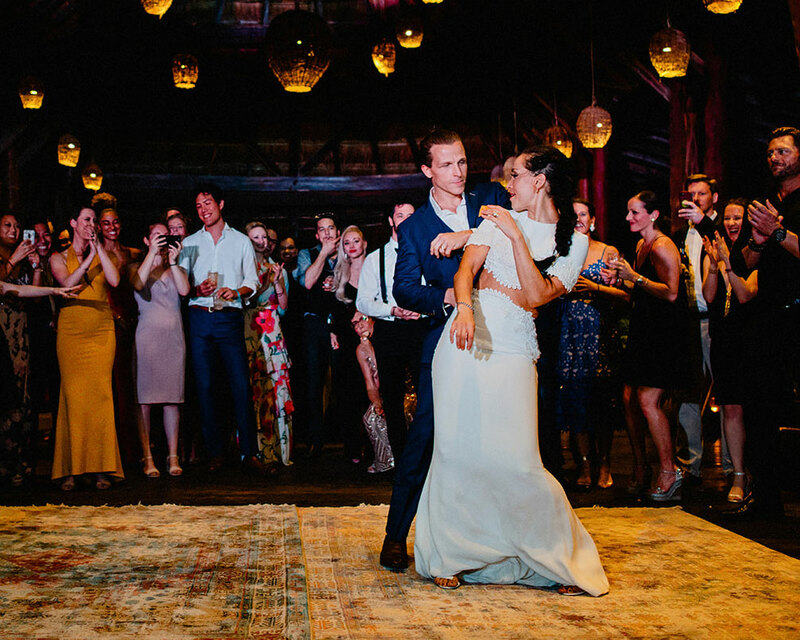 Both Arzon and Butler are big music fans, and so it should come as no surprise that they were picky about what was playing throughout their wedding day. 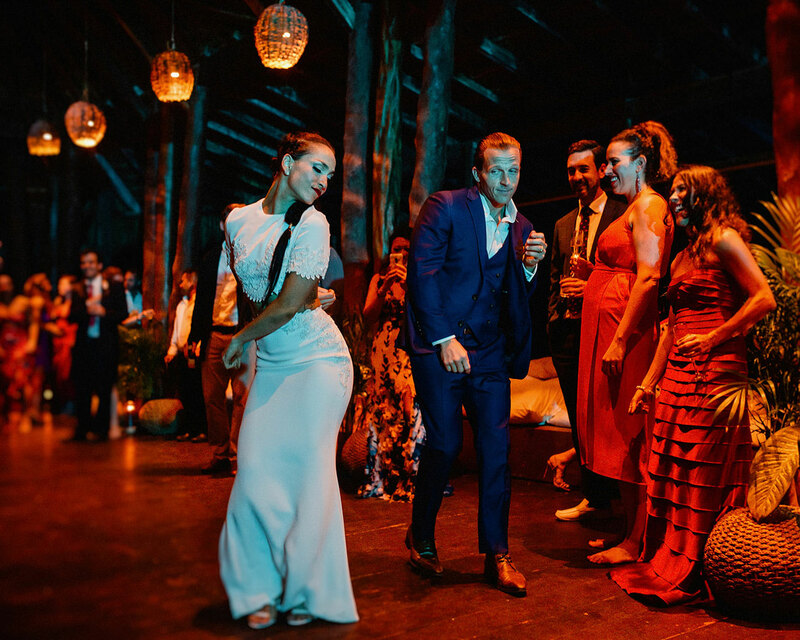 The pair selected DJ Mode, who customized the music selection after flying in from NYC for the day. 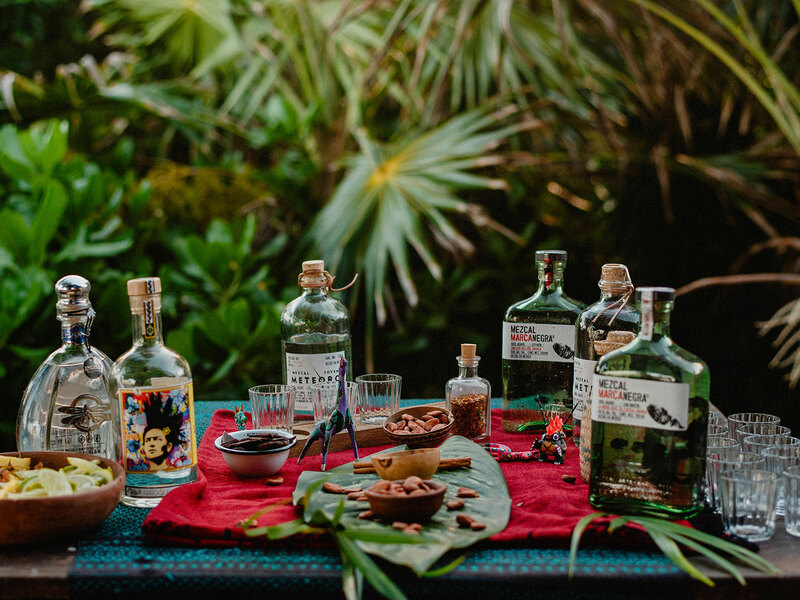 The couple got creative with their cocktail hour beverages, offering up a number of custom-created cocktails, courtesy of Mezcal in the Jungle. 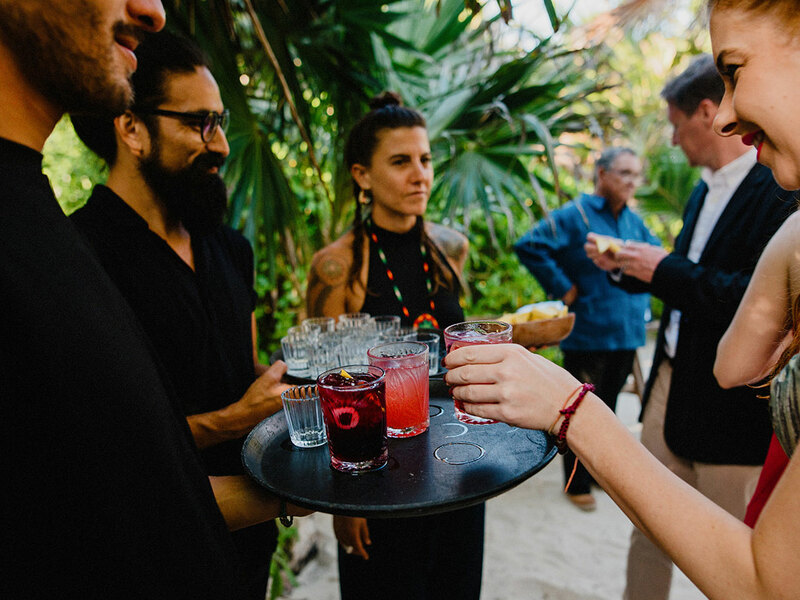 Drinks included the Lovely (raspberries, lemongrass agave honey, fresh pineapple, Mezcal); the Sirio (tangerine juice, infused aperitif, basil, Mezcal); the Velvet (hibiscus elixir, pineapple, yellow lemon, Mezcal); and the spicy passion fruit margarita (Mezcal, fresh passion fruit, chile de arbol tincture, himalayan salt rim). 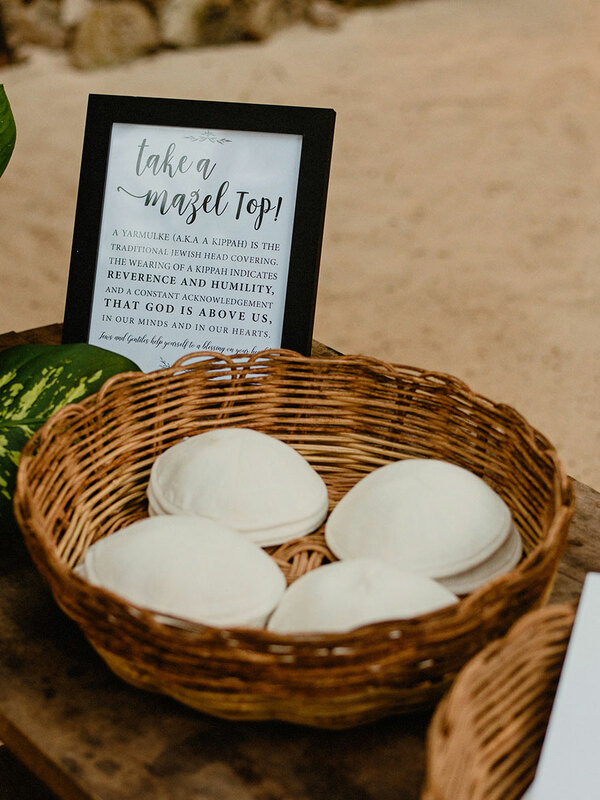 To complete their guests’ experience, the couple sent everyone off with prepared bags that included custom aviators (#arzoninlove), custom-etched palo santo to “clear their energy,” all natural/organic SPF, bug spray, and healthy vegan snacks. 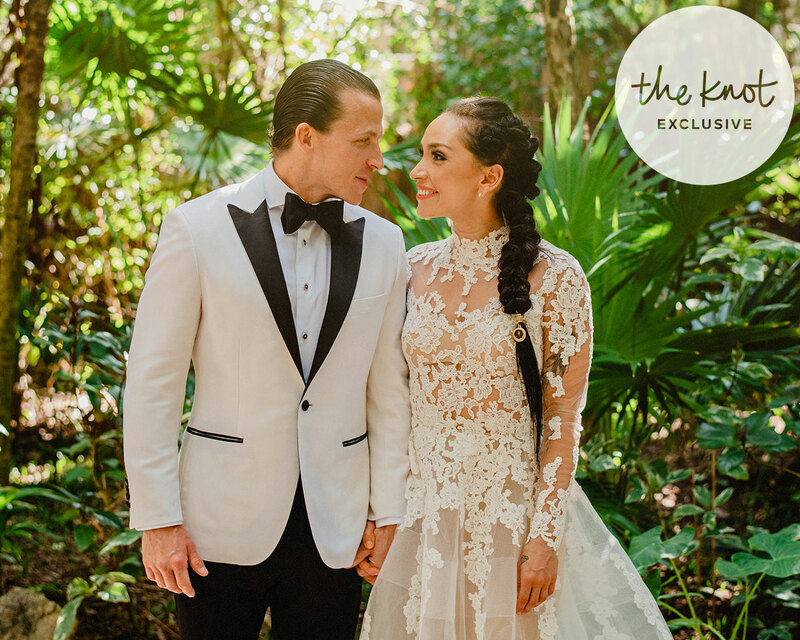 Be the first to comment on "Exclusive: See Robin Arzon’s Wedding Photos From Her Tulum Ceremony"